Oh, how I thought my days would be filled with time for baking during my visit north. How very wrong I was. Bikes, walks, swims, kayaks, runs, and well… ice cream have been the constants in our days for the last few weeks. So now, truth be told, I am a few breads behind schedule. Why do I care? you might ask. I have no idea other than I want to finish my new years resolution. I did manage to knead up one winner a few days ago though. It was so moist, with a soft crust after the first day (which was really nice) with an extraordinary potato flavor. The addition of keeping the somewhat bitter skins of a russet intact, makes for a distinct taste when fermented and bubbly than baked to a golden loaf. This one is a bread and butter kind of bread. 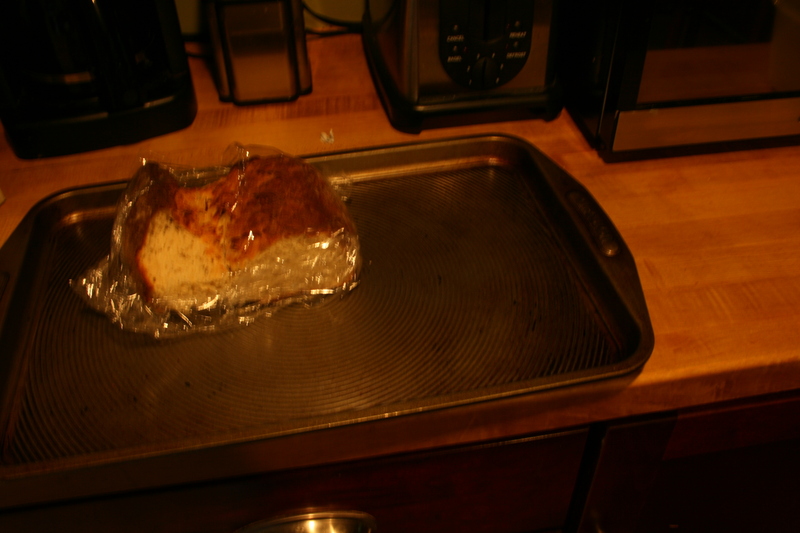 And sadly, I did not seal it quite enough so it was not an ideal shape for toasting (but I can imagine that would be another tasty way to enjoy this weeks choice). I happened on the recipe in Baking with Julia, and I do hope anyone who has been reading these bread posts (so many of them come from this charismatic culinary genius) has made the time to go out and get this one. So, in haste I choose not to post the recipe. I almost forgot to take a picture as well! So this is all that was left by the time I got around to it. And what a picture it is. Geesh. I could have taken the time to at least focus! Ah well. Better luck next time. This entry was posted in the year of bread and tagged baking, baking with julia, bread, rustic potato loaf. Bookmark the permalink. why thank you! All of Julia’s recipes are just that. brilliant! thanks for stopping by!